Today I am welcoming guest writer, Jay Harris. Jay is a Home Depot sales associate in the Chicago area, is a regular Home Depot blog contributor on bathroom decor projects and products. Jay's interests range from discussing bathroom fixtures to writing on bathroom storage and faucets. 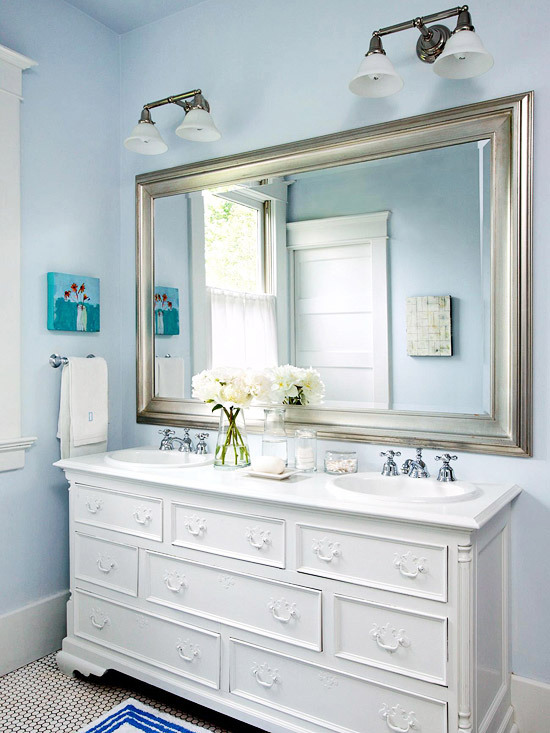 You probably only need to spend a few minutes perusing Pinterest or the latest issue of your favorite home decorating magazine to cull big ideas for your bathroom. Unfortunately, for many of us, those ideas are often greater than the space with which we have to work. In fact, while sizable bathrooms are now considered the norm in new construction, the washrooms in older homes only averaged about five by eight feet. 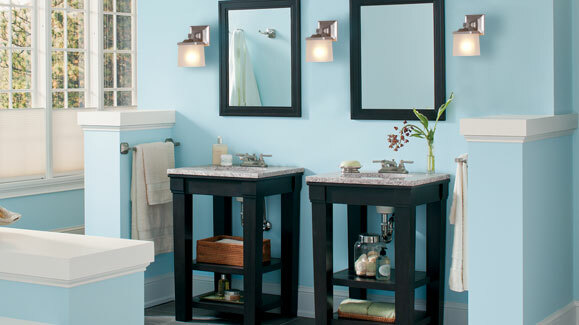 But despite its diminutive dimensions, your bathroom can still pack a giant style punch. 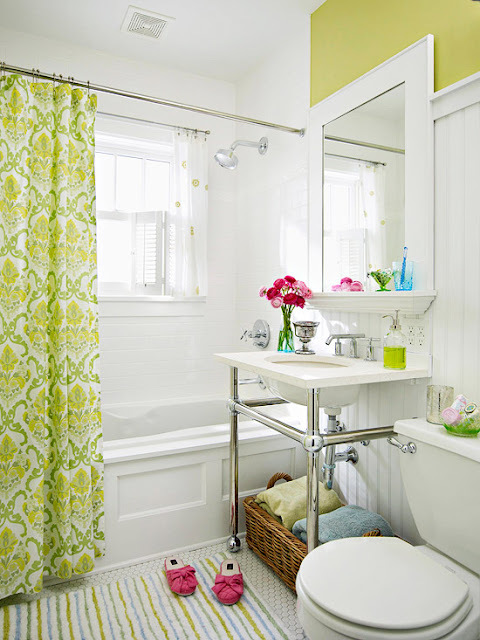 Here, I'll share a handful of smart tricks for visually enlarging the space and shed some light on the best design elements to brighten your bath. Make smart use of any dead space along your walls by incorporating carefully thought-out shelving. Hang a series of open shelves along a back wall or above the commode for organizing those sundries used daily, and then install a shallow shelf just above the door for stowing spare towels and toiletries. Recessed bathroom cabinets can also transform otherwise unused wall space into a clever storage cubby. 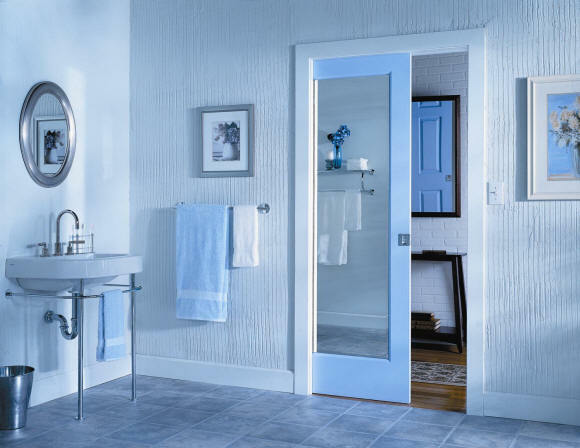 If your bathroom quarters are so snug that you have to squeeze in beside the toilet just to close the door, then a pocket door may be a smart space-saver for you. Provided your wall is wide enough to accommodate a pocket, isn't load bearing, and isn't fraught with wires, cables, and ductwork, any capable handyman should be able to retrofit your entry using a pocket door kit. A monochromatic palette of light tones is the simplest selection for punching up the size of your space. But don't feel limited to just whites and brights. 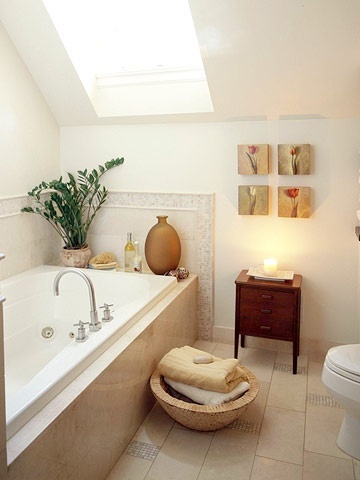 Especially if your bathroom has ample natural light, a rich, dark color can make the walls of the room recede. To avoid a closed-in feeling, opt to paint just one wall a deep color, which will serve to visually push it back. Pattern operates in a similar way. In a little room, too much pattern can become overwhelming, so use patterns in small doses. Think about accenting one wall with a large wallpaper print or adding a clean-lined window treatment in a complementary fabric. Whether laid out on the diagonal or lined up with the wall, larger floor tiles are ideal in a small bathroom. With fewer grout lines and an uncluttered look, 12- or 18-inch square tiles provide a clean and orderly foundation for your petite privy. 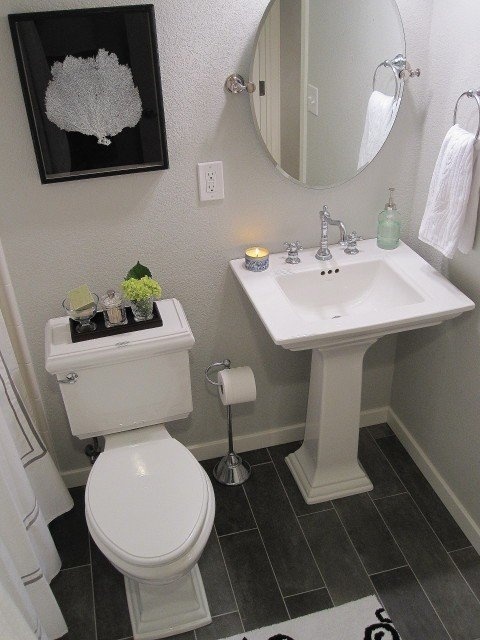 Though a vanity sink does serve to hide your sundries from view, it also takes up valuable real estate in a tiny bathroom. Choose a pedestal sink instead -- just be sure you can organize your toiletries in baskets or on shelves to maintain a clutter-free feeling. If you do prefer a vanity cabinet for storage purposes, consider one with a curved front, which maximizes usable space. Increase the illusion of space with plenty of shiny surfaces, be it nickel-finished faucets, floating glass shelves, or oversized mirrors. Each of these elements helps to bounce light around the room, making it seem brighter and, thus, bigger. You might even decide to cover one entire wall in frameless mirror tiles. A curbless shower entry is perfect for a small bath, as it doesn't break up the room's footprint. If your budget won't allow the existing shower stall to be entirely transformed, turn to frameless glass doors, which are preferable to the visual barrier of a shower curtain or heavy doors. 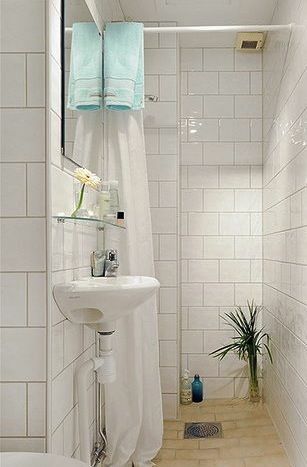 Alternatively, you can hang a clear shower curtain, allowing the line of sight to continue all the way to the rear wall of your shower stall. You'll sacrifice a bit of bathroom privacy, but gain a lot of light in return. Layer on the lighting for a bright and function finish; include both task and ambient lighting to generate the illusion of a larger room. And maximize natural light wherever you can. If your bathroom boasts a window, don't hide it behind light-blocking blinds. Instead, utilize window film for a frosted look or replace your standard window with glass blocks to permit light without losing privacy. If your budget allows, think about installing a skylight to visually lift a cramped ceiling and introduce plenty of desirable daylight. 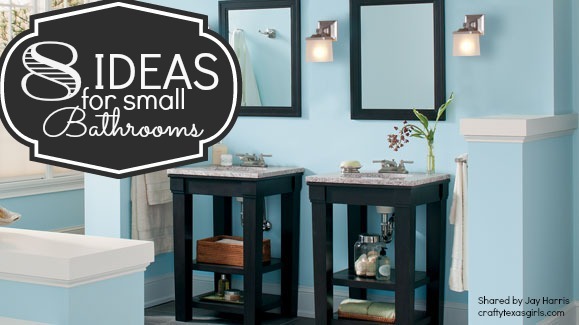 What tips do you have for making the most of your small bathroom space? Special thanks to Jay Harris for joining us today and sharing some great ideas in this guest post.